CHICAGO -- The highly-anticipated Western Conference Finals duel between the Golden State Warriors and Houston Rockets was electric as anticipated, full of thrills and chills. 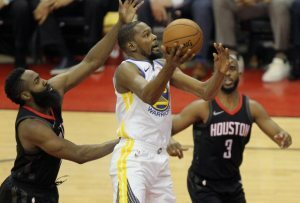 But after 48 minutes of action, it was the defending champion Warriors who drew first blood, beating the host Rockets 119-106 in Game 1 on Monday night at the Toyota Center. Kevin Durant, a former NBA MVP and last June's Finals MVP, was too hot to handle with 37 points on 14 of 27 shooting including thee made 3s. Steph Curry wasn't as explosive with a relatively low 18 points, but his Splash Brother, Klay Tompson, erupted for six triples to finish with 28. James Harden had a fast start, nine quick points that helped Houston take an early 23-14 lead. The presumptive MVP went on to tally 41 but it wasn't enough as the gritty Warriors, showing the poise of champions, recovered and shot 42 of 80 field goals including 13 of 33 from long distance. "Our guys have been here before, Our guys have a lot of experience, they felt this, they relish this," Warriors head coach Steve Kerr told The San Francisco Chronicle. "If we want to beat them we have to be mentally sharper. There were too many times we had mental lapses," Rockets coach Mike D'Antoni said after the loss, one that surrendered homecourt advantage to Golden State. Houston, the No.1 overall seed in these playoffs, finished with 39 of 85 from the field and 13 of 37 from 3-point range. It simply wasn't enough against a talent-loaded, focused Golden State. Game 2 resumes Wednesday night (Thursday AM in the Philippines) at the Toyota Center. If the Rockets want to make this a long series they need to hold serve because the Warriors, who host Games 3 and 4 in Oakland, California, have an active 15-0 streak at the Oracle Arena. caption -- Kevin Durant had an easy time scoring 37 points against the Rockets. He shot over shorter defenders and danced around bigger opposition. The result was just as easy, Warriors 119, Rockets 106.